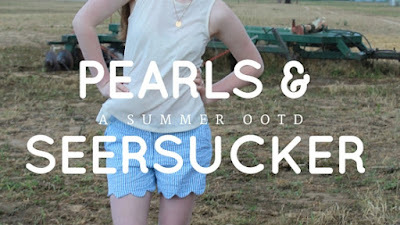 I went shopping at Belk a couple of weeks ago and found these super adorable seersucker shorts by the brand Crown & Ivy. They were on sale for $24.99 from the original price of $44.00 and I had to get them! I have worn them every chance I get because they are so comfortable and super cute. I have been pairing them with a plain white tank, a cream colored lace bralette, and a pearl necklace. 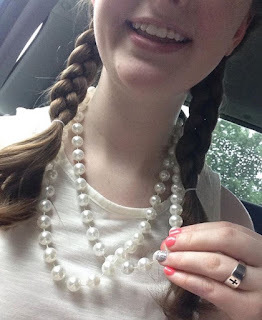 In the picture above I am wearing my monogram necklace from Marley Lilly which is also cute but I felt the pearls suited the outfit more. This is the perfect summer outfit because it's cute and comfortable. I noticed after looking at some pictures of myself wearing the outfit that the shirt doesn't look good untucked so I would recommend tucking in the shirt.